The labor shortage crisis shows no signs of abating. By most accounts, it will worsen in the future as more and more of the Boomer generation retire and stay retired. There are many reasons employers have been unable to find the people they need—lack of skilled people in the hiring pipeline has been at the top of the list. There are also more subtle causes. The one getting the most attention is the lack of worker housing. People can't take jobs they can't get to efficiently or if they have to pay too much for housing that is close enough to the workplace. The commute in places like San Francisco can be more than an hour each way. This has become enough of an issue that companies are choosing to relocate to other parts of the country so that they can find workers and workers can find adequate housing. Every White House budget has to make assumptions about both revenue and spending. The latest Trump version is no exception, and these assumptions are often shaky. It is assumed there will be some $1.2 trillion in taxes coming to the U.S. from programs that Trump and the GOP are trying to cut and from taxes that are to be extended despite very strong opposition from the business community and members of Congress. A big part of that revenue will supposedly come from taxes called for by the Affordable Care Act. This is something the GOP wants to repeal. The tax extensions will be fought hard by business; it looks now as if they have sufficient support. Without this revenue, the budget deficit gets that much worse. Pressure is quickly mounting within the farm community over trade with Japan. This has traditionally been a very lucrative market for all manner of U.S. farm output. The connection between Japan and the U.S. was supposed to be strengthened by the development of the Trans-Pacific Partnership (TPP), but the U.S. backed out of the deal just as Trump was coming into office. The group of members was expected to fade away, but it hasn't. Now, the other members are rapidly filling the space that was once occupied by the U.S. Canada, Australia and even the EU have dramatically expanded what they sell to Japan—either because of the TPP or because of the deal the EU made with Japan. U.S. farmers want a deal of their own and fast. Trump and President Jair Bolsonaro (Tropical Trump) of Brazil have nothing but praise for one another as they meet in Washington. Right now, these talks are avoiding the awkward conversations about what Brazil wants to sell to the U.S. (everything from steel to soybeans and airplanes). The main focus has been on familiar populist themes such as crime. Both leaders are worried about what happens in Venezuela should Maduro step down or should there be a conflict that drags the region as well as the U.S. into the mess. The U.S. and Europe are certainly not alone when it comes to concerns about immigration. The influx of Asian migrants into Australia has profoundly changed the nature of the country and has added to infrastructure woes in the biggest cities. A decision has been made to reduce immigration by 15% and to require immigrants to reside in certain regions as a way to relieve the pressure on the biggest cities. Prime Minister Narendra Modi has been popular with the business community due to his reforms. but the community has never quite forgiven that radical monetary move. Now, it worries that his Hindu nationalist side is coming out. His support is slipping within the business leaders. Not that the latest round of trade talks between the U.S. and China rise to the level of the "Charge of the Light Brigade," but there has certainly been enough drama over the last several months as the two nations dance around one another seeking leverage and determining what will and will not be acceptable to their populations and constituents. The word is that an agreement in principle is close; that a deal of some sort will be struck by the end of the month. As with most such negotiations, the ultimate deal will not be what either nation really wants, but what can be deemed acceptable. At the start of these talks, it was obvious both nations had as much at stake politically as they do economically. For the U.S., this was about resentment of China on a variety of fronts as well as the notion that China had been stealing U.S. jobs for years. There has always been a good deal of China bashing taking place in the U.S. This is essentially just an escalation. China has been making its own strides in the world and sees the U.S. as an impediment to these gains. The truth of the matter is neither nation really likes being dependent on the other, but both economies really do rely on each other, so disengagement is not a solution that works. Analysis: The issues that separate the two have been narrowed. That has provided some hope that a deal can be worked out—provided there really is a political will to do so. President Trump could very well scotch the whole deal at the last minute if he thinks that will garner support from his base. President Xi Jinping is also facing opposition from those in China who do not have the same confidence in this move to a consumer society and don't want to jeopardize the export sector that brought them this far. Ostensibly, there are three major issues to be resolved by the end of the month. The first and likely most important to the U.S. is the issue of protecting intellectual property. China has been notorious for theft of technology. There has been ample evidence the state has been engaged in all manner of industrial espionage. The Chinese have promised many times in the past to end these practices, but have broken the pledge over and over again. There are now Chinese companies that have intellectual property of their own to protect so the government appears more willing to live up to their promises. The U.S. wants a quarterly review of this effort and wants the right to impose tariffs if it thinks the deal is being defied. China doesn't want this unilateral action to take place without consultation as it does not trust the Trump team. The bottom line is that neither side trusts the other side. A second issue is China's import patterns. The U.S. wants the Chinese to buy far more from the U.S. so the trade deficit is lowered. China has agreed in principle, but has balked at the dollar amount demanded by the U.S. (over $500 million a year). China still plans to focus on farm exports from the U.S., while the U.S. wants more access to their consumer sector. The third area of contention has been Chinese dumping. This is less of an issue than it has been, but remains a sticking point. This was the impetus behind the imposition of the steel and aluminum tariffs as Chinese dumping of steel had distorted the market across the world. In 2016, a peace deal was worked out with FARC, the leftist guerilla group that had been at war with the government for decades. The FARC conflict had cost a quarter of a million lives, the vast majority of whom had nothing to do with the two sides in the conflict. The deal allowed the FARC to disband without risk of trial and imprisonment, and for many in Colombia that seemed far too generous. Meanwhile, elements of the FARC and other more radical groups vowed to carry on the fight. President Ivan Duque is a supporter of harsher treatment for FARC leaders and wants changes to the peace deal. That has thrown the whole issue back into public debate, and at a very tense time. The collapse of the Maduro regime in Venezuela has meant Columbia has been hosting over a million refugees. There is fear that many more will come. Analysis: To make matters worse, the drug cartels are rebuilding and regaining strength as the Mexican cartels have been too busy killing each other over territory. The connection between the drug gangs and radical FARC members still exists and gets more solid every day. The fear is that the peace deal could unravel and plunge the country back into near civil war again—just as the pressure of Venezuelan refugees amplifies. Colombia has been a staunch ally of the U.S. and will be counted upon to help deal with the end of Maduro, but at the moment, it has plenty of its own problems to deal with. Duque was elected by referencing the hardline policies of past presidents. The challenge for most economies is the efficient use of labor—this is the key to almost any kind of economic growth, but especially in a system like that of the U.S. The engine of the U.S. economy is consumption. That means having a population with enough money to do that consuming. This, in turn, means the population is gainfully employed. For business to grow, it needs employees that can maintain appropriate levels of productivity. It is a very delicate balance in that companies have to watch their labor costs if they want to succeed, but if they collectively pay too little, there are not enough consumers with enough money to buy that output. One of the struggles in China over the last few years has been getting wages up without destroying their advantage as a low-cost production country. The government wants a more consumer-centric economy. Wages in many places have risen by as much as 1,000%, but this makes exports harder as costs go up. The U.S. is facing a different set of labor challenges. Analysis: For the past few years, the rate of labor force participation in the U.S. has remained quite stable at around 63%. It had been expected to get worse than this due to the number of Boomers hitting retirement age, but many of those who are eligible have elected not to retire. Some have even come back into the workforce. Still, this number means that 37% of those who would be eligible to work are not in the labor force. This is a number that often gets misused and misunderstood—it is not the number of unemployed people. Those out of the workforce are out for a variety of quite legitimate reasons. Most are out because they are retired. Others are students or they are staying at home to take care of children or elderly relatives. Some are disabled and, of course, some are unwilling or unable to find jobs. As the U.S. has been contending with a chronic labor shortage, the importance of expanding the rate of labor force participation has dramatically increased. The White House Council of Economic Advisors has released a new study that outlines the steps it thinks should be taken to address the problem. There are several recommendations, but four stand out as the highest priorities. Some are quite familiar and end up being part of everybody's proposed solution, but a couple are more unique and would require some fairly radical changes to the way that society handles the workforce. One of the more common, calls is for additional training—always on everybody's list. The challenge here is that cooperation between business and the educational establishment has to be dramatically improved and attention has to be focused on the people being trained as their willingness varies considerably. They can't just stop work to get trained. Not everybody is going to take to learning a new job. A second suggestion is also pretty common. Higher pay will be an incentive to go to work. The government can play a role here through the lowering of taxes. The greater the amount of take-home pay, the more that people would favor work. There is not much in the report that deals with the minimum wage though, but the logic would presumably be the same—higher minimum wages would be an incentive to take those jobs. One of the more radical proposals and one that got a lot of attention was providing better child care options so more women can enter the workforce. This would mean encouraging businesses to offer child care, and more controversially, to reduce the regulatory burden on child-care providers. The assertion is that too much regulation has kept potential child-care providers out of the market, but critics point out that poor child care is worse than none at all. The point made in the report is that lack of child care keeps some 60% of eligible female workers out of the labor force. The U.S. is not a leader in the provision of child care as the report points out, but it stops short of suggesting that government provide child care options as is more common in Europe. The second innovative approach is rooted in dealing with those who have a criminal record. There are millions of people who have committed nonviolent crimes and have served their time, but struggle to find work once they enter the labor force. The U.S. has placed a great many people in jail for drug offenses. Now, many of the actions these people engaged in are legal. The question is how to get employers to consider people with criminal records. Some of the effort will be in educating employers, but liability laws will have to change as well—business owners can be held accountable if an employee with a criminal record commits a crime. It is a near certainty the Fed will leave interest rates just where they are at the meeting this week. That doesn't mean, however, it will not be influencing the market and the economy. There will be a lot of attention focused on what it says to justify the halt in rate hikes given that it was asserting they would go up only a few months ago. Analysis: The most important commentary will revolve around what it thinks the longer-term prognosis for the economy will be. The comments last year suggested it thought growth would be steady, but now, there is a lot of comment regarding headwinds and threats. It is very likely that there will be a downgrade to the predictions made regarding economic growth this year—another reason to hold off on hiking rates. There may also be some comment on ending the process of selling off the bonds that had been accumulated during the recession. At one point, the Fed was holding some $6 trillion in assets, but that number has now fallen to about $4 trillion. The Fed may start to discuss how long it plans to continue this process; observers think this may occur in October. The analysts will be listening for anything that suggests this would be the timing. The Fed will be seeking to keep some of that timing discussion quiet as it determines the impact on the bond markets and economy as a whole. There are so many names and descriptors of what might be referenced as "dumb" collectively. That is because nuance is important. I have never been upset with ignorance—either my own or someone else's. All that ignorance means is that a person doesn't understand something. It is a condition that can be readily addressed if there is a desire to do so. I am utterly ignorant when it comes to things like how a car engine works, the rules of cricket and the proper way to clean a fish. There are millions of other examples, but the point is I can rectify the situation if I want to. Willful ignorance is ignoring the facts and insisting on a bogus interpretation. Today, we seem inundated by people who are either extremely gullible or deliberately ignorant. The latest tragedy in New Zealand has spawned a rash of misinterpretations and outright lies. One story asserts the killers were Islamic terrorists attacking Christians and the media is covering it up. Trump is accused of being responsible for the attack because the fanatic quoted some of his words. The first example is an outright lie and the second is carrying personal opposition to an extreme. We can't even begin to solve the many problems facing us if we can't dismiss outright lies and if we can't set aside hyperbole and vitriol. We have descended into a world where drama replaces contemplation and instant reaction replaces considered response. This is not a good place to be. This chart is a little dated, but it makes an interesting point that has not changed much in the last few years. 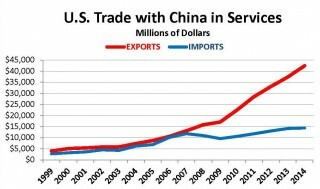 The U.S. is running a substantial surplus with China when it comes to services. Not that it offsets the trade deficit in goods, but it is interesting to note that the expansion of services sales to China coincides with the more dramatic years of Chinese economic growth. It was a maturing economy, but is still far behind the western states in everything from accounting, finance, law, marketing and the like. The U.S. has gained a major service market in China even as the deficit in goods has expanded.